My sweet girls were helping me clean up the basement the other day. 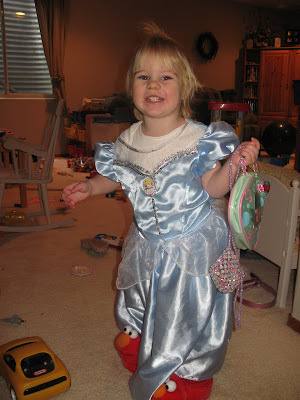 Except their idea of cleaning up was to try on all the dress up clothes. We had a great time together as always and actually did get the basement cleaned. Courtney tries so hard to be like her big "sissy". She put on shoes and carried a purse with a camera and phone in it. She carried the baby around while she pretended to be the mommy. It was just darling to hear her repeat Sydney's soft words to the baby. The funniest was when she would take a picture of me (which she did about 50 times) holding the baby. She would place the baby in my arms and ask the baby if she could take a picture ("picture baby? "-she would say). She would then prompt the baby to say cheese and smile. It was oh too cute. How could I be so lucky to be their mom????? that is so cute. 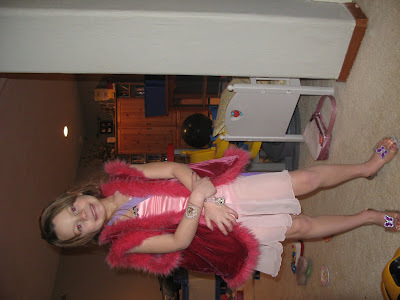 wow sydney brought back memories of when you would dress up and pose. i had to look twice i thought it was you stacey.